A quick reminder that our free New Year/Christmas-ish Concert (re-arranged from a snowy December) is this Sunday, January 21st, from 4.00pm. 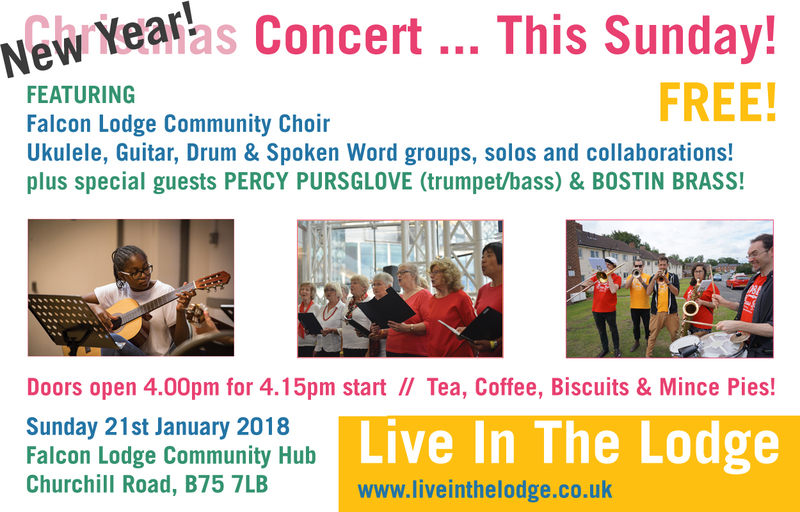 Featuring the Falcon Lodge Community Choir, Ukulele and Guitar learners, spoken word and a drum/percussion group, plus … we’re also very excited to be joined by very special guests back on the Lodge (but this time indoors!) – the amazing Bostin Brass! We also welcome the brilliant internationally touring trumpet/double bass player Percy Pursglove, who will be helping to accompany and support our instrumentalists. It would be great to see you there, to support the hours of hard work everyone has put in, as well as the rare opportunity to catch Bostin Brass with Percy Pursglove in concert, instead of marching around the streets! Please spread the word, and don’t forget, it’s free entry for all.